Last week, when a court in Baroda acquitted all 21 persons accused of killing 14 others in a gruesome incident of communal frenzy that has come to be known as the Best Bakery case, painful memories of the 2002 riots�were revived for residents of Gujarat's second largest city. On March 1, 2002, 14 persons were burnt alive in the premises of Best Bakery in the Hanuman Tekri area of Baroda. The bakery owner's daughter, Zehraunissa Sheikh (19), who is also known as Zaheera, was a prime witness for the prosecution, but she turned hostile in court and weakened the case substantially. So why did she turn hostile? Last weekend, Zaheera's mother Sehrunnisa Sheikh spoke to some reporters and admitted�they had lied in court for fear of their lives. Zaheera's guardian in Baroda, who hid the girl in his home soon after the riots broke out, spoke to rediff.com on telephone, on�condition that he not be identified, because he too fears for his life. This is his account. "Khauf, Madam, khauf [terror]... that forced Zaheera Sheikh to change her statement. Fear of death will force you to do anything. I am a happy man with a large family, but I can't speak against this government. "Let me share my grief with you. When Zaheera's house was burnt down by rioters she saw people murdered mercilessly. She was petrified. She and her mother had no male member left in their household. She wanted help and confidence. "After the riots she shifted to my home. But later she had to go back to her own house, which is not in a Muslim locality. No Muslim witness can live in a mixed locality and give evidence against rioters who were mostly her neighbours. "Immediately after the riots Zaheera's first problem was a safe residence. She was helpless. She didn't want to live amongst the Hindus who had burnt her employees and her relatives alive. "I am a person without resources, but I do have large contacts. I am a small-time trader. How can I get a new home for Zaheera? I told her to take the help of the Anjuman Bahami Imdad Committee. They had received lakhs�of rupees in foreign donations to help�victims of the Best Bakery case. We were informed about it at community meetings. "Zaheera was miserable when she was asked by the Committee to pay Rs 50,000 to buy a home. "The Committee has built some 80 to 100 flats for the rehabilitation of riot victims. She paid Rs 50,000 out of compulsion. "When the judge started�hearing the evidence,�she [Zaheera] was approached by the defendants. I heard, I have no proof, but her circle told me that one accused was ready to pay her Rs 22 lakh. This amount is too huge for us, unheard of. "Zaheera desperately wanted some help to sell�her property measuring about 20,000 square feet for about Rs 4 lakh. But she was not helped by members of the Muslim community. Everybody just forgot her. "When Zaheera was living with me I found she was a courageous girl.�She told me she would never compromise for money. I can tell you that she has turned hostile because she was not cared for�by the community in her time of greatest need. In that condition fear, khauf, haunted her, engulfed her. "Do you know, she went to the police station and identified all the 21 accused with their correct names from the crowd. Senior police officers are witness how bold she was. But when she turned hostile in court I rushed to her house. I asked her why did she do it? "She claimed that she was pressurised by�a Muslim�dealer who lives in her locality. We know he is part of the police-criminal-politician nexus. "Zaheera also told me�a car had come to pick her up and drive her to court. In�the car, she was warned, "Tamne�pan jeevta salagavi deshe [We'll burn you alive as well]." "Zaheera kept telling me that not a single Muslim was present in court when she had to give evidence. That scared her. Her mother is correct when she told the media that some relatives of the accused were hinting that her neck would be slit if she gave any evidence. 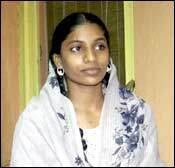 "I can assure you�she was promised a few lakhs,�but she has not been given any amount. She was also�told that the accused would help her sell her property. "Many Muslims like me believed, wrongly, that the relief committees were taking care of the legal cases. None of us knew that most of the NGOs [non-governmental organisations] are sitting on the funds donated to them and doing nothing. "Zaheera has not been in touch with me after the court hearings began because she said unknown people follow her wherever she goes. "Bharatiya Janata Party legislator Madhu Srivastava, who is one of the biggest land developers in the city, personally knows people around Zaheera's home. His network�amongst the Hindus and Muslims on the ground is enviable. People say he has�helped the accused in this case. If so, it's a tragedy of Indian democracy, what else I can say? "No one should blame�Zaheera for lying before the court. How can you expect that a girl who has seen the murders of 14 people will not fear death?" Ayodhya: Do you have a solution?